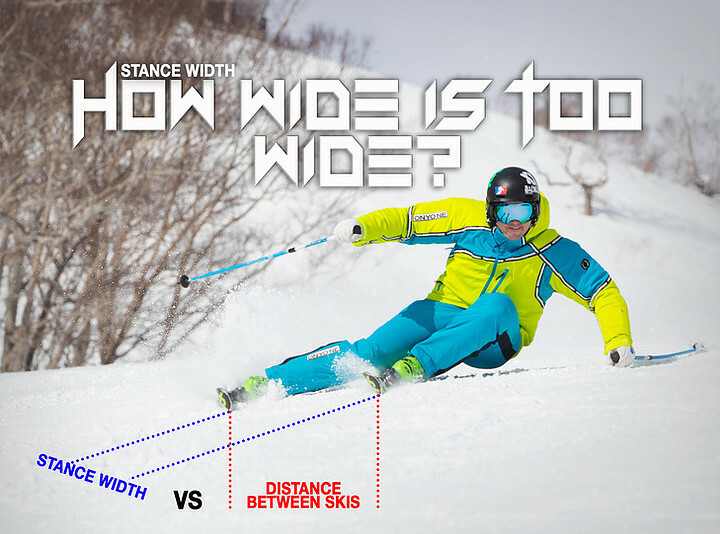 Width of stance is a heavily debated topic within the ski world with much discussion online and amongst instructors/coaches around the world. The “modern”, wider stance is often the opinion that seems most convincing, particularly to those taking lessons and one that is impressed upon young racers climbing the ladder. Like all movements in skiing one has to first identify the objective and then look at movements within the limitations of the body to best facilitate this goal. (**It is important here that everyone understands intent/objective is key and this may differ from person to person – This article is intended to share my objective in this area). My main objective when carving (SL or GS) is to balance against the highest edge angle possible (determined by conditions, speed, ski type, turn phase etc.) to create the maximum amount of pressure pushing on me to change my direction of travel. During the turn when under intense load, I am trying to feel the force from the snow push back through my outside foot up through a long, aligned outside leg to my Centre of Mass (CoM) or core. Successful balance is gained when the CoM is far enough to the inside to balance directly against the snow force pushing back at my outside ski. Given that I am trying to find this alignment with my outside leg, my inside leg is rather insignificant to me while all of this is going on. The inside leg must collapse/soften/shorten to get out of the way and allow the hips to move in further through the turn. Apart from collapsing to facilitate inclination, whilst turning, the inside leg is coming along for the ride. If my stance is too wide during the turn then my inside leg ends up directly underneath me which becomes tempting to balance on when times are getting tough. It is during the transition that both legs are most active and stance width has a real affect on the overall performance. During the transition both legs need to move efficiently to facilitate a simultaneous edge change and transfer of weight. As such the transition for the most part determines the width of stance. During the transition both skis must change edge at the same time while the CoM/hips/body are crossing the skis. This crossing will inherently change the edges, but it is the ankle and knee that guide this edge change while the body crosses to engage the new edge accurately and precisely. With this in mind we are now looking at pronation/supination of the foot to change edge along with internal/external rotation of the femurs to move the knees inwards or outwards depending on whether the leg is becoming the inside or outside in the new turn. To maximise the range of movement in the femur (which facilitates pronation/supination) one must start in a neutral position where the centre of the ankle is aligned under the centre of the knee. The knee must be aligned somewhat under the ball and socket joint in the hip. Once you find this position you will have the most range in both rotation of the femur and also pronation/supination of the foot. Ultimately when the leg is aligned it will line up directly under the ball and socket joint or hip joint. Therefore the width of stance will be determined by the distance between the 2 ball and socket joints in your pelvis. As a result the width of stance is often referred to as hip width. If you are sitting down you can find this width by moving your sitting bones in your backside to the front of the chair. Line your legs up parallel so that the centre of your knee is directly in front of the ball and socket joint. Now look down over each knee cap and line up the centre of your knee cap with your 2nd toe. This will give you an idea of your ideal width of stance. This may be narrower than you were expecting. From this position you should have the most range and control over changing edge with the lower body during the transition and you can try rolling your feet from side to side while sitting there. You can try this in a wider and narrower positions too. You might feel that every little bit wider you go will make it harder to roll both feet simultaneously with the same edge angle. The same is true as you go narrower. One might look at this width of stance and think to yourself that this seems much narrower than that used by racers or high level skiers. This is where it can get a little confusing as the width of stance is different to the distance between the skis. If you have a look at the picture below you will see that the distance between the skis is rather large. But the width of stance in relation to the pelvis is still the same as discussed above. 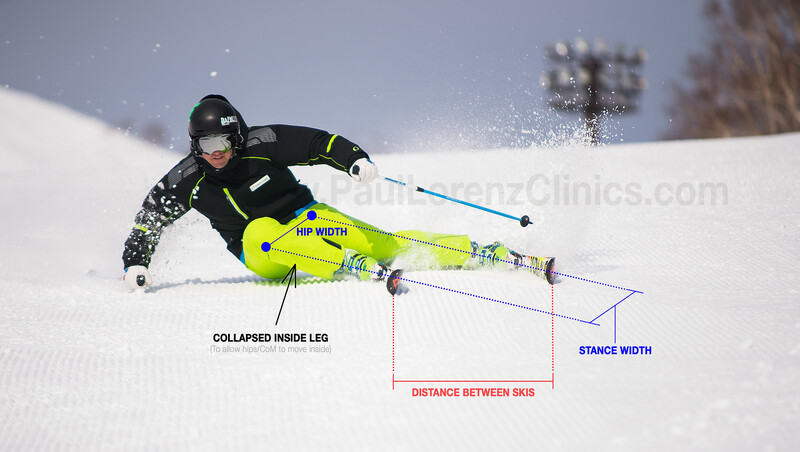 This is because as the skier moves further inside the turn, the inside leg has shortened as discussed above. As such the distance between the skis increases but the width is unchanged. Some call this “vertical separation” of the legs. Many coaches/instructors look at a skiers stance and encourage the widening to achieve what appears like a wider/functional stance that is more balanced. In fact it is the way a skier moves inside the turn that creates this visual width and not the widening of the legs. That said, when working with younger athletes that may not possess the strength or fine motor skill to make the above movements during the transition, it can be a good idea to train a wider stance to assist with inclination and angulation through the turn. Once this position is established the skier feels confident moving into the position one can focus on the transition, edge change and changing leg lengths that is required at a high level. Does the skier have leg independence (is the skier balanced on one leg or both)? Is the inside leg shortening as they move inside? If not it will hinder edging, their ability to move inside and balance on the outside ski. How well is the downhill ski changing edge during the transition (if too wide the downhill/new inside will not cleanly carve/slice the top of the turn). There are times when a narrow (legs together) stance is more suitable. A narrower stance in the moguls will allow both skis to travel through the narrower troughs more easily and will help with agility/mobility. In powder a narrower stance will provide better float and ensure that both skis track through the same snow conditions.